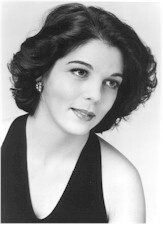 Louise Fauteux is a regular performer in the northeast, most recently singing with the West Hartford Symphony Orchestra, Opera Theatre of Weston, VT, the Westchester County Chorale, and Alarm Will Sound (NYC). In 2006 she closely followed the birth of her daughter with an English song recital sponsored by the New Haven Oratorio Choir and the Mozart Mass in D and Horatio Parker's Hora Novissima for the Connecticut Master Chorale. Prior to that, she completed a year as Resident Artist for Dicapo Opera in New York City, covering the role of Violetta in La Traviata. For Dicapo Opera she was soloist for a Venetian concert tour of the Mozart Requiem and Vivaldi Gloria. She has been heard in leading opera roles in The Impresario, The Magic Flute, Hansel and Gretel, Dido and Aeneas, Amahl and the Night Visitors, The Telephone and The Marriage of Figaro for such venues as Opera North, El Paso Opera, Raylynmor Opera, Opera Theatre of Weston, Boheme Opera, Hat City Music Theatre, and American Classical Orchestra. For Un Ballo in Maschera with Connecticut Concert Opera, the Hartford Courant characterized Louise Fauteux as a "pert, boyish Oscar" with "clarion tone in her two showpiece arias and a soaring top in the great Act I ensemble."